Damien Robertson is another young member of the Newcastle Falcons squad, but Robertson is one of the only young Falcons who was not born and raised in Newcastle. 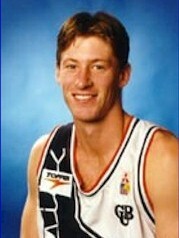 Robertson is a product of Victorian Basketball and he played his Junior Basketball there. He got a chance with the Falcons in 1996. He has shown he can come in and give the Falcons some good minutes at point guard. Robertson was dissapionted when he was overlooked for the Australian U/20 team. He is a very speedy Point Guard with an improving jumpshot and good passing skills. He will get more opportunities in 1998.